The Manteo Preservation Trust has put together another incredible tour – this time of important local buildings, old and new. The 13th Annual Holiday Tour of Homes will walk participants through the extensive and rich history of North Carolina’s Outer Banks, visiting various landmark homes and historical properties. Take in the architecture and style of some of the older properties in the area – a stark contrast to modern Outer Banks vacation rentals. Start the afternoon off right with a little taste of famous local rum while you check in at Outer Banks Distilling, (510 Budleigh St., Manteo, N.C.). This historic distillery is the first stop of the day. From here, follow your trusty Holiday Tour of Homes map and visit any of the sites in any order, making for a customized self-guided tour. The tour takes place December 2, from noon to 6 p.m. Ticket sales start at 11:30 a.m. the day of the event. Holiday refreshments will be served all afternoon at Outer Banks Distilling, the tour HQ. No food or drink is allowed in any of the locations. The tour costs $20 per person. While the event is all-ages, strollers are discouraged due to the size of many homes and expected foot traffic. Bikes from Manteo Cyclery will be available for those who wish to tour on wheels. Bikes are limited, and will be offered on a first-come, first-served basis. For the full tour line-up and more details, contact (252) 473-7336. The tour is a celebration of classic Outer Banks coastal living. For the last few centuries, Americans have settled in the Outer Banks, in search for not only a home but a new way of life. Houses here have a unique simplicity, with the ocean at the heart of the architecture and décor. Whether in downtown Manteo or the end-of-the-road northern tip, the home has been a place of gathering through sunny summers and the chilly Atlantic winds of winter. Small town lifestyle is at the core of the Outer Banks, and the Manteo Preservation Trust hopes to foster this camaraderie for centuries to come. Tour participants will be able to enter the buildings and see an active historical property firsthand. With Christmas around the corner, it’s safe to say many properties will be decorated accordingly. There are three types of properties you can expect to see on the tour. The first type includes historic homes whose owners give tour participants a taste of life on the edge with a visit to a quintessential mid-20th century Outer Banks home. The second kind of property on the map is historic buildings including businesses current and past. A tour favorite is Outer Banks Distilling. Famous for its Kill Devil Silver Rum, it is the only active distillery in the Outer Banks. The distillery is housed in a big red-brick brick factory building on Budleigh Street that was construced in 1946. The final type of property you’ll visit on the tour is new constructions that borrow classic elements from pre-war architecture. These new homes offer a distinct and fresh style to the Outer Banks property landscape, but retain the vintage feel of the Outer Banks centuries ago. 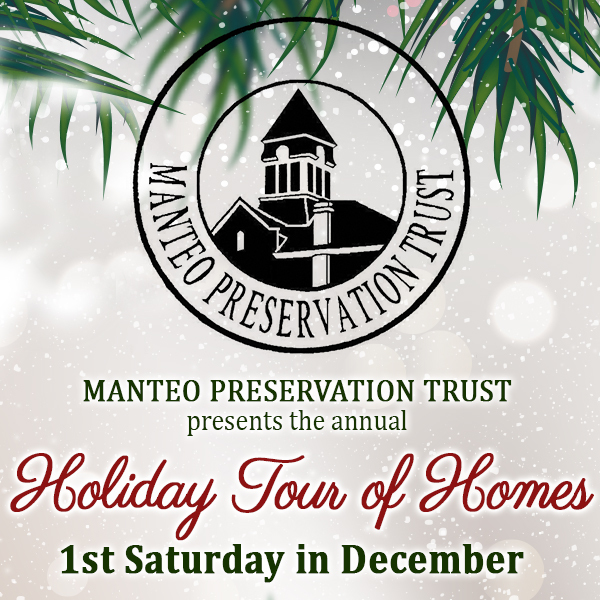 The Manteo Preservation Trust’s Annual Holiday Tour of Homes encourages both appreciation of the history and culture of the area and the enjoyment of the Christmas season. But the holiday fun doesn’t stop (or start) with the Tour of Homes. The Friday before the tour, December 1, the annual Manteo Christmas Tree Lighting rings in the season at 5:45 p.m.
Saturday morning before the tour begins, check out the Christmas Parade. The parade will happen at the same time as the Tour of Homes to keep visitors entertained on their way to the next to property. The spacious sandy beaches may attract thousands of visitors to Outer Banks vacation rentals every year, but the homes offer something different – a combination of history, architecture, and Christmas spirit. Get a fascinating up-close view of some of the most extraordinary historic buildings and homes on the East Coast during the Manteo Holiday Tour of Homes on your upcoming Outer Banks holiday getaway!